It's always a strange sensation to find something that you've grown up with, whether it's a piece of music, a story, or a movie, is now deemed officially old enough that it has to be reintroduced to later generations. And so it has come to pass with The Evil Dead, which is now over thirty years old. I still remember renting the videotape from my tiny, beloved video store down the street and watching it late one night with friends and family, unprepared for the oozing onslaught we were about to experience as we witnessed a group of friends' weekend jaunt to an isolated cabin in the woods turn into a marathon of demonic possession and gruesome death. There's often a certain power to low-budget horror films, those ones that seem to come from nowhere, feature a cast of mostly unknown faces and are often filmed with murky film stock. The lack of professional technique and big stars offer an unfamiliarity that can puts us on edge, coupled with the unpredictability that comes with a lack of fealty to studio or executive mandates. Any character can die and often in really unpleasant ways. And sometimes from these humble origins great talent can emerge. 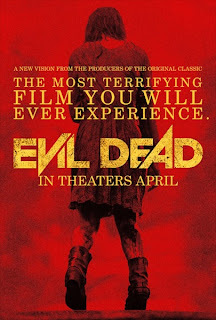 Evil Dead put the spotlight on two: its energetic and inventive director Sam Raimi and its much abused leading man Bruce Campbell. The two, along with producer Robert Tapert, would press on with two sequels that would see the series evolve from outright horror to splattery horror-comedy to swashbuckling comedy-fantasy. And since the mid-90s, fans of the Deadite chronicles have eagerly awaited another installment. So it was with some trepidation that I watched the trailers for this new high-budget version, apparently aimed at bringing the brand-name back to the highly gruesome and highly scary tone of the original 1981 film. It didn't help that it would be directed by novice Fede Alvarez, who to this point was only known for an amazing no-budget Youtube short called Ataque de Pánico! While there was undeniable talent there, did he have what it takes to refit a horror classic? Was there any point to an Evil Dead film without Raimi's ingeniously demented hand guiding it or Campbell heroically taking his lumps? From the outset, it's tricky for me to consider this movie on its own merits and not in comparison to the original film and its sequels, a situation not aided by the numerous references, from lines and situations to actual snippets of audio, that are hidden throughout this update. However, I will try, at least for a while, to evaluate it as a standalone film. The film gets off on the right foot by giving some interesting narrative tweaks to the basic storyline. In this case, the group has come together not to party but as a form of drastic intervention for Mia (Jane Levy), a drug addict who's been battling demons of a less tangible and slimy form since the death of her mother. 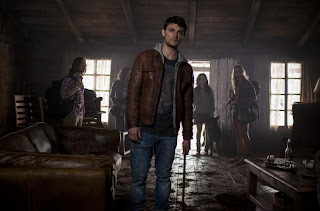 Now her estranged brother David (Shiloh Fernandez), his girlfriend Natalie (Elizabeth Blackmore) and their friends Olivia (Jessica Lucas) and Eric (Lou Taylor Pucci) have brought her to their secluded family getaway in the hopes the remote location will help her go cold turkey. Of course, there will be worse problems to face once the gang discovers gruesome evidence that someone has broken into the cabin to conduct some strange occult ceremony in the basement. They also find the Naturom Demonto, a.k.a. the Necronomicon, a book bound in human flesh and filled with spells allowing the possession of the living by blood-thirsty Kandarian demons, along with copious notes scrawled on the margins warning others not to read it. Guess what one of the group does? Before long Mia is seeing horrific visions and being violently harassed by the local flora but of course everyone assumes she's hallucinating or that her urgent pleas to leave are just her attempts to back out of her decision to kick her habit. Their opinion begins to change when members of the group start becoming possessed and turning into cackling, sadistic zombies. Cue the torrents of blood and bile. As a director, Alvarez gives the film a glossy look that might strike some as a bit too reminiscent of the Platinum Dunes spate of horror remakes, with lots of overly composed tableaux bathed in the kind of saturated brown and blue hues that post-production digital tweaking can provide. He does do well at providing some good jump-out-of-your-seat-and-spill-the-popcorn scares and succeeds admirably in one arena that will turn off many people (or at least the ones who probably shouldn't be seeing this type of movie anyway): the violence, most of which appears to have been achieved with a welcome minimum of computer effects. I was frequently amazed by how much the production gets away with on an 'R' rating. Characters are skewered, sliced, nailed, shot, cooked, tossed into furniture and pushed to their physical limits until you're ready for them to collapse from sheer exhaustion or blood loss, while the possessed often engage in squirm-inducting acts of self-mutilation. Make no mistake, this is an endurance run of carnage. At the same time there is considerable effort to give some real dimension to the two main characters in the film, Mia and David, who have endured a strained relationship after David essentially abandoned her while their mother died, a trauma that the film hints pushed Mia toward her self-destructive drug use. Making this key relationship familial rather than romantic does seem to subtly increase the stakes, particularly with David's determination to make amends by sticking by her, even as things get especially grim. Mia's predicament is practically Hitchcockian, as any warning she gives regarding the creepy manifestations of the demons she encounters is immediately discounted. Alas this interesting dynamic is somewhat tossed aside as the film progresses. However, Levy is easily able to distinguish herself as the strongest of the film's young actors, doing a solid job conveying Mia's turn from sullen resentment of David to complete terror at what's happening around her. Her growing jumpiness actually leads to one of the film's best shock scares, one so potent I burst out laughing at how well it worked on me. Unfortunately, despite the interesting layers to his character on the page, Shiloh Fernandez does little to make himself distinctive or very interesting, which is a particular problem considering he ends up carrying a lot of the dramatic weight. In fact none of the other actors are all that compelling or do much to distinguish themselves from the dense protagonists of any other recent horror movie. And that brings us to another of the film's primary problems and a classic horror movie no-no: a lot of the sympathy we should have for these characters is undone because everyone keeps making agonizingly stupid choices. When our thick-headed heroes discover a trail of blood leading to the basement trapdoor and a collection of skewered animals down there, do they leave? Do they call the police? Of course not. When Mia's condition worsens and David worriedly suggests they should take her to a hospital, Olivia, established as a nurse, arrogantly declares she can take care of Mia just as well, a patently stupid viewpoint that immediately makes us despise her. Meanwhile, Eric is the man responsible for reading from the Necronomicon for no real good reason so that lowers his likeability from the start. Even characters we never get to know fall into this trap. The Necronomicon is left behind wrapped in barb-wire, apparently to prevent others from opening it. Why not bury it or conceal it somehow? Now let's get to the inevitable comparison: after following the basic structure of the original pretty closely, the script nobly tries to play on our expectations of the story and serve up a twist to throw us off. It's a nice effort but the way in which it is done is implausible (though it does allow for the kind of construction montage made famous in the other films) and the set-up for it throughout the film somewhat sabotages our investment in the characters. The film's changes to the rules regarding possession leave things a bit too murky. While in the original films it was pretty random as to which person the demons would choose, here the evil is portrayed as almost viral and each host must be exposed in some way, a good concept which unfortunately isn't always portrayed consistently. Then there's the question of dispatching the beasts themselves. While the original series is admittedly not always consistent about it from film to film, it's generally accepted the only way to stop a possessed person is dismemberment, and even then the pieces will chase after you. The remake is very blurry as to what it takes to stop its possessed, varying from standard zombie rules (aim for the head) to suggesting they are just amped-up but still pretty mortal humans. As remakes go, Evil Dead can probably be declared a noble effort if not entirely successful. Alvarez might have been better off to break further away from the original rather than constantly pay homage to it, since this ensures the original haunts the movie like one of those Kandarian demons by reminding us how much better Raimi and his cohorts managed to do with so much less. It is by no means the most terrifying film you will ever experience but those looking for a gruesome night out should get their money's worth in bloodshed and startles. P.S. : You may want to stick around for a fun if perfunctory stinger after the credits run.